Lot Detail - Grant Fuhr's 1981-82 Edmonton Oilers Game-Worn Rookie Season Fiberglass Goalie Mask with LOA - Photo-Matched! Grant Fuhr's 1981-82 Edmonton Oilers Game-Worn Rookie Season Fiberglass Goalie Mask with LOA - Photo-Matched! Backstopping a powerful Victoria Cougars squad that advanced to the Memorial Cup in 1981, Grant Fuhr was selected 8th overall that season at the NHL Entry Draft, with his very first NHL contest in an Edmonton Oilers’ jersey occurring on Oct 14th 1981 vs Winnipeg. A decade of dominance in Alberta would follow, with Fuhr largely responsible for the Oilers’ success with five Stanley Cup championships won along with six All-Star Game appearances, with the Vezina Trophy as the league’s best netminder secured in 1988. The Spruce Grove native would also proudly represent his nation during the decade, suiting up for Team Canada at both the 1984 and 1987 Canada Cup tournaments, with his unbelievable performance in the latter against an always dangerous Soviet squad well remembered. The 1990s would witness time spent with Toronto, Buffalo, Los Angeles and St Louis, with a final 23-game swan song with the once-rival Calgary Flames to close out the decade and one of the modern era’s greatest goaltending careers. The current holder of five NHL records including most wins in a single postseason, Fuhr would be honoured with Hall of Fame enshrinement in 2003, with the Oilers’ retiring his #31 that fall. The absolute perfect piece to represent his iconic career, we are pleased to be able to present Grant Fuhr’s Edmonton Oilers’ mask, worn during his rookie season in 1981-82, with this paramount treasure amazingly photo-matched! Originally obtained from former Oilers’ team photographer and noted collector Bob Mummery, "D. Eastcott" and "G.A. Schultz" (with address) are stamped into the inner forehead section, with the latter well known to netminders during the era, as Schultz served as a former goaltender before producing masks, with examples fashioned for both pros and amateurs alike throughout the 1960s and 1970s in the Edmonton area. The first maker to utilize Kevlar in his manufacturing, Schultz’s quality masks were worn by noteworthy backstops including Ken Brown, Chris Worthy and Jack Norris, along with Fuhr. 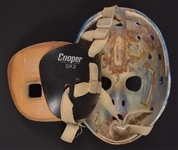 Don Eastcott was a major-junior and minor pro netminder throughout the 1970s, and it’s important to note that Grant's first mask was a leftover Eastcott model. Featuring the iconic paint job emblazoned in the mind of countless hockey fans lucky enough to see a young Fuhr tend the Oilers’ crease, deep orange covers the central portion terminating near the top of the forehead, with thick blue stripes beginning beneath the eye sockets and descending to the bottom of each cheek. Additional blue triangular-shaped panels grace each ear section, with Oilers decals centralized over each. The original strapping remains intact, with some of the interior padding now lost, with the foam backing over the head plate detached. 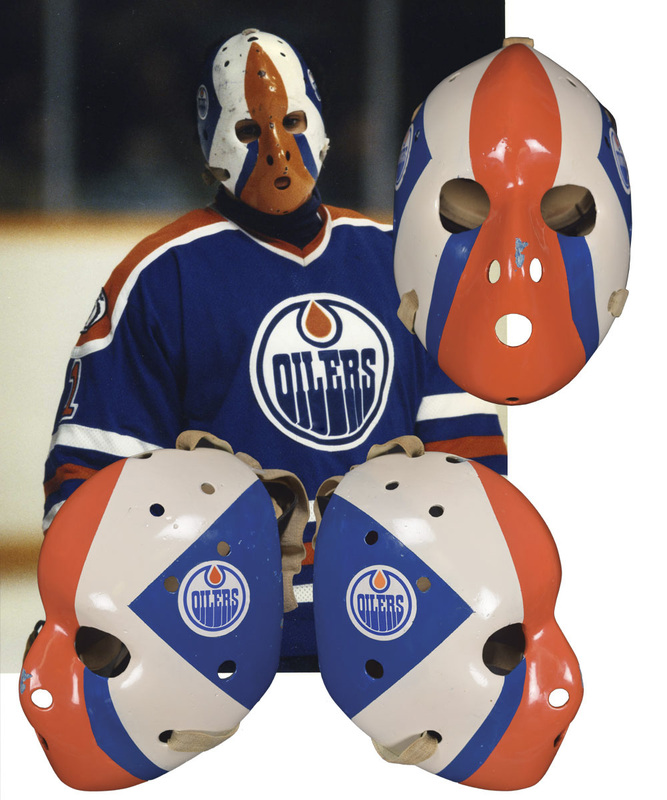 We should also note that the mask was repainted in the late-1980s by Alphonse Delorey, an Edmonton painter and contractor who was also a game-day staffer in the Oilers locker room. He repainted and touched-up a number of Fuhr’s masks during his time in Edmonton. Painted by hand originally and somewhat crudely, the mask was repainted in stages, with tape used to achieve straighter lines, with a cleaner overall aesthetic. There is expected wear to the interior, with a number of noticeable small blemishes to the exterior covered by the repaint. There is also a large chip over the nose section that is not original to game use. Two included numeric images along with Getty Image #147492684 from November 14th 1981, have been matched to the particulars of the eyes holes, with the right eye hole more rounded and slightly larger than the left eye hole, with the small indentation along the top edge of the left eye hole visible. One of hockey’s most iconic designs, this Hall of Fame-caliber keepsake would dominate literally any world class memorabilia collection. An LOA from Classic Auctions will accompany, and please take note that this item may be subject to a silent reserve.